As the two Jewish men on stage slip on their Nazi armbands, preparing to take the Siegfried Oath, the portly man sitting next to me seems unsure if he should laugh. Even the old man next to me, who was a child during World War II and has lived his life aware that bearing the weight of German history is serious business, takes off his glasses and rubs tears of laughter from his eyes. "Why shouldn't we be able to see this in Berlin? It's been shown everywhere else in the world," he says. That question overshadowed the opening of The Producers in Berlin's Admiralspalast, the iconic theater where Hitler once sat in the elegant Führer's box and tapped his foot to the tunes of the light opera The Merry Widow. And answering it requires asking two more. It wasn't long into the show's premiere that the first  will German audiences laugh at a parody of Hitler?  was answered with an uproarious yes. But the second is trickier: Should they? It seemed only foreign correspondents and a few Germany commentators were asking, however. If any of the people in the sold-out opening-night audience at Admiralspalast felt a bit of angst about laughing at blond-haired Nazis singing "Europe, we're going on tour," they got over it pretty quickly. "I saw it in the U.S.," says Berlin's mayor, Klaus Wowereit, as an entourage of transvestites in Bavarian drag saunter past in the theater courtyard. "I'm glad it's playing in Berlin now. A musical can't hurt anyone. After all, it's a parody of Hitler." In Germany, Hitler is thought of as evil incarnate, a madman, an easy target for parody (indeed, Brooks borrows heavily from Charlie Chaplin's The Great Dictator and Ernst Lubitsch's 1942 To Be or Not to Be). But whenever anyone in Germany tries to poke fun at him, the same discussion erupts about taboos and having respect for the weight of history and national guilt. Dani Levy, a Swiss filmmaker who lives in Berlin, tried to lighten things up with his 2007 comedy My Führer, which had modest success at the box office. Yet even Levy confesses to feeling queasy while watching The Producers in a theater full of Germans. "It hurts sometimes to watch people laugh at something that was so cruel," he says. "But every step we take towards dealing with the past more courageously is good." It's taken Germany so long to put on Brooks' camp musical that the piece seems to have lost much of its original punch. When the film was released in 1969, it was provocative. 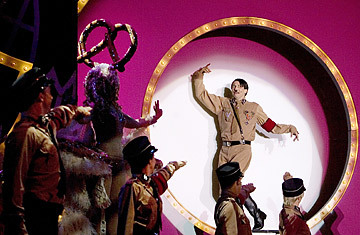 The 2009 German production ups the shock value of Nazi symbols and dancing blond chorus girls singing "Springtime for Hitler and Germany," but it is clear that today's audiences aren't so easily scandalized. "It was kind of banal," says Rainer Dietmar, 40, a librarian. "Is it O.K. if I say I didn't like it?" It is not clear whether it will be extended beyond that, but when the curtain dropped on opening night, Berliners jumped to their feet in a standing ovation. Time will tell how long it takes before they grow tired of having the Führer back in town. See pictures of Hitler's rise to power. Read "Better Than The Producers."